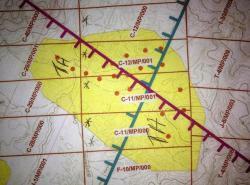 1,200 Acres of Prime Gold & Diamond Land. Mahdia Mining District, Guyana, South America. Seeking Partner, Joint Venture or Sale. With Over 3,000 Acres of Rich land, GDPS Mining Inc. is seeking Investors to execute Medium scale mining operations. Government Geological Survey Geomagnetic Survey. Prospecting. Mahdia Mining Area is very rich in Gold & Diamonds as Many miners operate there today and more are heading there. Virgin and semi-mined land available.